Male: Green upperparts and red crown, nape and moustache. Female: Like the male but with black moustache. 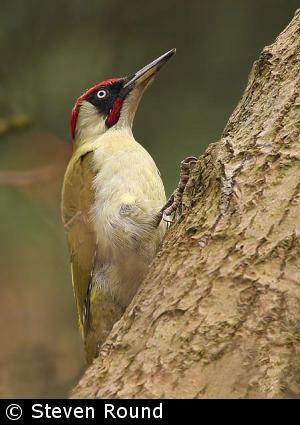 The Green Woodpecker is our largest native woodpecker (bigger than a Blackbird) and has green mantle and wings, yellowish rump and whitish underparts. The crown and nape are red. There is black marking around the white eye. The tail is blackish with green barring. The bill is grey-black and legs olive-grey. The male's black moustache has a red centre while the female's is all black. The juveniles are speckled with black on the underparts and head, and spotted with white on the mantle and coverts. As with other woodpeckers, the stiff tail feathers are used as a prop when it is clinging to a tree and its toes are specially arranged with two pointing forwards and two backwards. Their call is a loud, far-carrying laugh or "yaffle". They are a woodland bird and feed on insects, such as ants, beetles and caterpillars, by extracting them from crevices in trees with their long sticky tongue. They are also often seen feeding on ants on the ground, e.g. garden lawns and pastures. The eggs are about 32 mm by 23 mm. They are smooth, glossy and white. Both adult birds share the duty of incubating the eggs as well as feeding the altricial young once they have hatched. 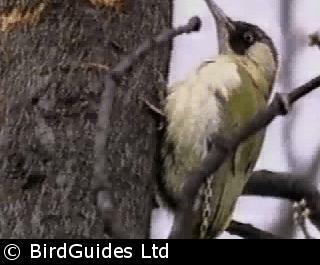 Green Woodpeckers are sedentary, rarely moving far from their nesting site. Young birds disperse from their natal grounds in the autumn. By the 1950s, this woodpecker had extended its breeding range into Scotland and its numbers were increasing. More recently, however, the populations in south-western England and west Wales have fallen. Further afield, they have declined in much of Europe because of the loss of nesting sites, through the loss of mature woodland and destruction of heath land.